In our house it is leftovers - again! Hopefully the last of the Christmas leftovers. We have Haystacks for tea tonight, so today for lunch I took the last of the chicken and turkey and made pies using filo pastry for a change (and to use the pack of filo I found at the back of the little freezer!). They were delicious. They were fresh. They are all gone! How did I whip up these gourmet delights? I just cleaned out the fridge. I have childhood memories of eating Christmas Day leftovers until after the New Year. I don't remember anyone getting sick, I just remember having leftovers for breakfast, lunch and tea for what seemed like forever. These days I'd rather not use leftovers after they are about 4 - 5 days old so if they're not portioned, packed and frozen immediately they are turned into another meals as quickly as possible. With this year's Christmas leftovers the boys made pita pizzas yesterday. They used chicken, barbecue sauce, capsicum, onion, pineapple and cheese as the toppings and they were delicious. So today I made the pies to use up the last of the chicken and turkey (we are not really turkey fans, but other family members love it so it was on our table on Christmas Day). Those pies were amazing. They were so good here's how I made them - if you have leftovers (or not, they really are that good I'd cook chicken just to make them) give them a try. Pre-heat oven to 175 degrees Celsius. Melt two tablespoons of the butter in a frying pan. Add the celery, carrot and onion and cook without browning until the celery and onion are clear. Remove from the heat and add the peas and the chicken and/or turkey. Mix well. Stir through the white sauce, parmesan and tarragon. 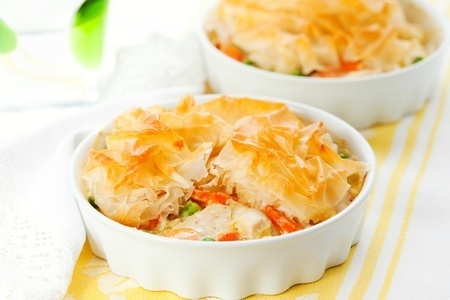 Divide the chicken mixture between the ramekins. Melt the remaining two tablespoons of butter. Prepare the filo by buttering a sheet then laying the second sheet on top. Butter the second sheet and lay the third sheet on top. Continue buttering and layering until you've done all six sheets. Cut the filo into six rectangles. Brush the edges of the ramekins with the beaten egg. Place a filo stack on top of each ramekin. Brush the tops of each pie with the beaten egg. Now you can either push down on the edges to seal and then trim the excess pastry or you can simply take the handle of a teaspoon and gently push the excess pastry down into the ramekin, between the side and the filling, to seal the pie. Bake for 30 - 35 minutes until the pastry is golden and flaky and the filling is hot through. *You can use chicken, turkey or a combination. I used a combination of leftover meats for these pies and they were delicious. **You could also use leftover cheese sauce if you have it. If you have a pie maker use it to make the pies instead of turning the oven on. You can use filo in the pie maker, or regular shortcrust for the base and puff for the top. You should get two pies from one sheet of pastry (two bases and two tops) so you'll need three sheets to make six pie maker pies.